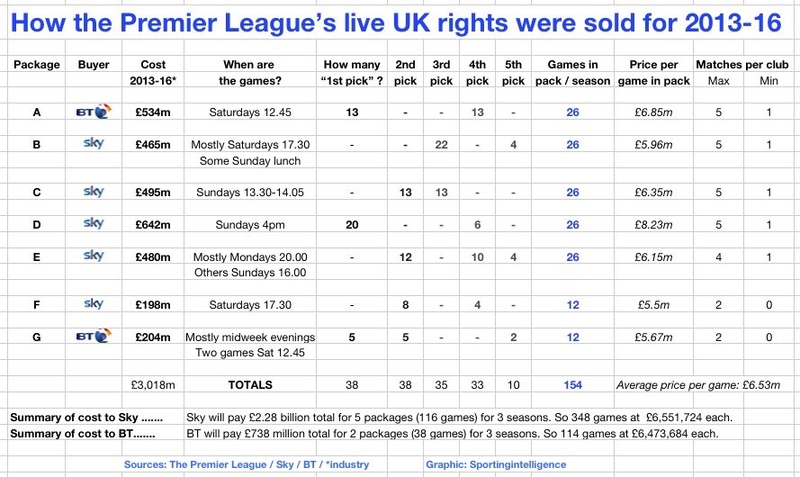 The £3bn cost of Premier League Football TV rights. Will it ever stop rising? A closer look at the rising cost of Premier League Football TV rights. August has arrived and the 2012/13 Barclays Premier League season is on the horizon. Those lucky enough to get their hands on season tickets for their respective clubs will see the campaign unfold before their very eyes while the aptly named ‘armchair’ supporters will have to settle for the next best thing, live television coverage. The battle to secure the television rights for the world’s richest competition has reached epic proportions with the latest deal, split between BSkyB and BT for the three seasons starting from 2013/14, worth a whopping £3.018 billion. This represents a 70% increase (£1.25 billion) on the current three-year contract shared by BSkyB and ESPN. It seems incredible to be talking about such huge sums of money when you consider the fact that we’re a nation shrouded in debt and deep into a recession. But as we all know, football is big business and the demand for the Premier League is arguably as strong as it’s ever been throughout its 20 year duration. The manner in which the final day of last season concluded has never been seen before and may never be seen again. Manchester United were on the brink of snatching the title from under the noses of their bitter rivals Manchester City until Sergio Aguero’s 94th minute winner against Queens Park Rangers ensured that it would be the blue half of the city celebrating their first league championship since 1968. It’s the sort of drama that keeps the fans coming back for more, season after season after season (even if you’re a Red). Such is the ever-growing appetite for football in this country, it begs the question whether the cost of televising it will ever cease to increase? To put the past 20 years into perspective, the latest three-year deal for the Premier League rights is worth ten times more than the five-year deal agreed in 1992 (£305 million) when the league was formed. BSkyB will undoubtedly continue to up the stakes to fend off any challenges from its competitors as it would be catastrophic to lose the stranglehold they have on their most prized asset. Their success was built upon securing the rights and their future is dependent on the renewal of them. The worry for the clubs outside of the top flight is that the distribution of the funding is causing an unassailable gap in revenues. The rich are getting richer and to the detriment of the less financially sound clubs, transfer fees and players’ wages are becoming over inflated. UEFA’s Financial Fair Play Rules, which are due to come into effect from the 2013/14 season, should nullify this trend to a certain extent but they’re unlikely to have any major bearing on the financial hierarchy. The concept of charging fans to watch live televised football was perceived as a major gamble back in the early 90’s. How ironic it is then that many of these fans, and even more so their beloved clubs, are as dependent on this concept now than ever before. As opposed to most other leagues around the world the Premier league is all about showbiz and razzmatazz. The inflated transfer fees add to the theatre. The TV stations are well aware of what the are buying I don’t see the harm.